After having traveled around New Zealand for almost 4 weeks seeing Tongariro National Park, Otago Peninsula, The Catlins, Mount Aspiring National Park, The Kepler Track and Doubtful Sound we have now reached the end of our trip. 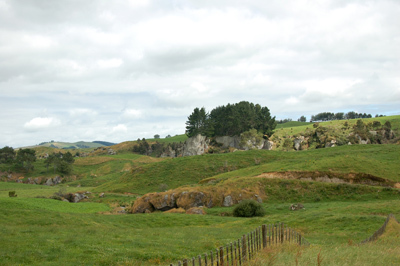 However, on the way back to Auckland airport we make a quick stop at Froggatt Edge, Wharepapa where some of the best rock climbing in New Zealand should be situated. 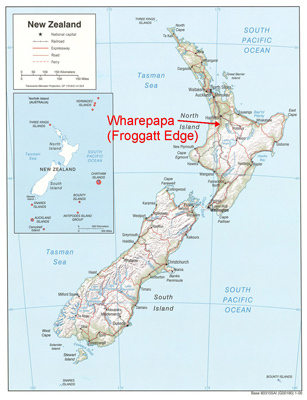 Map of New Zealand showing the location of Froggatt Edge. We buy the guide in Bryce's cafe where we meet the friendly owner who directs us to the crag. After driving back and forth we finally find the narrow gravel road that leads us directly to the crag. Froggatt Edge seen from the road. Elvira and I were both quite surprised about the high level of convenience at the crag: parking area i10 meter from the crag, two dry toilets and lots of new bolts. After scouting the area for a while we decide to climb a few routes on the Main Cliff which sported the longest routes (up to 25 m). 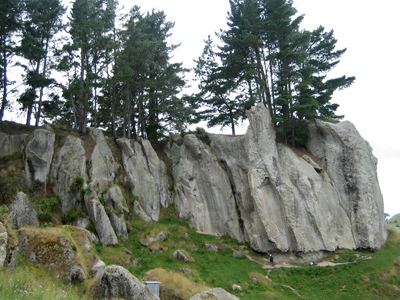 The Main Cliff, which sports the longest routes of the crag (up to 25 m). Elvira is standing below the excellent route Terror Incognito (18, french 6b+). The blue shed in the front is one of the two dry toilets located at the crag. 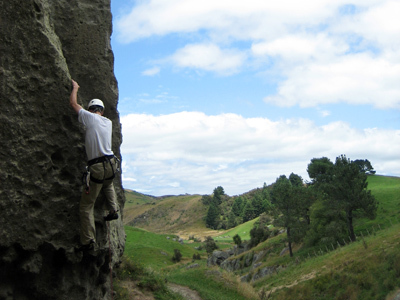 Neither of us had tried climbing according to the Australian/New Zealand grading scale before and I thus looked for an easy route to get acquainted with the grades and rock. I thus began climbing a route which was my favorite style (face climbing) and according to my conversions grade 16 (~ french grade 5c/6a). However, I hardly got to the anchor and thought that the kiwi's had to be really tough climbers! As I was lowered to the ground I re-checked the guide and to my great relief I discovered that I had taken the wrong route and thus onsighted Climatic Extension (19, french grad 6c)! What a deja vu from Red Rocks where I did exactly the same with the american grading system - when will I learn!? 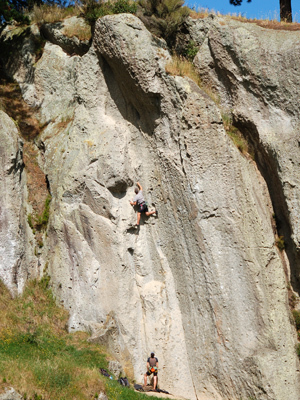 Hans onsighting Climatic Extension (19, french 6c). After my stupid route finding error we climbed another handful of excellent routes including the three-star route White Christmas (16, french 6a). A kiwi climbing the great route White Christmas (16, french 6a). 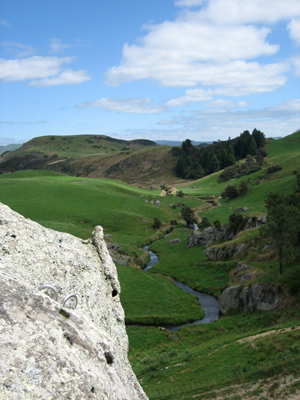 I had heard a lot about bad rock quality in New Zealand, but Froggatt Edge was certainly an exception. The rock was very solid and all the routes we climbed were of a high quality and bolted well. Finally, the views were just stunning! The beautiful view from the top of the Main Cliff. 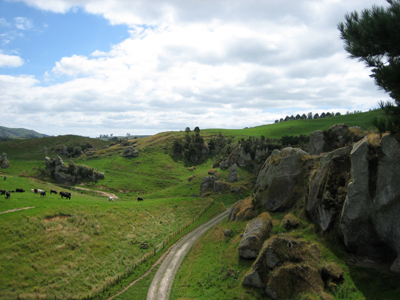 A typical New Zealand landscape and a stunning climbing setting. A bolt anchor is seen in the front. And another beautiful view from top of the Main Cliff. As seen, the road access is excellent! 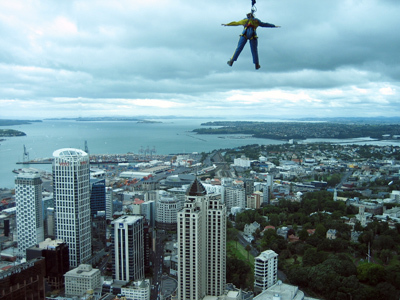 Sky jumper falling 192 m from the Sky Tower. 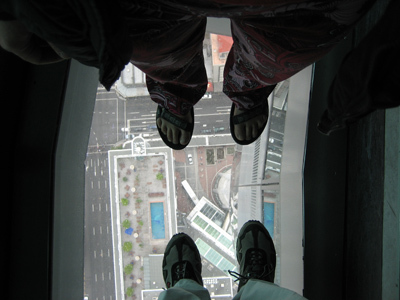 .... and fun standing on armored glass looking down! Elvira and I standing on armored glass in the Sky Tower.